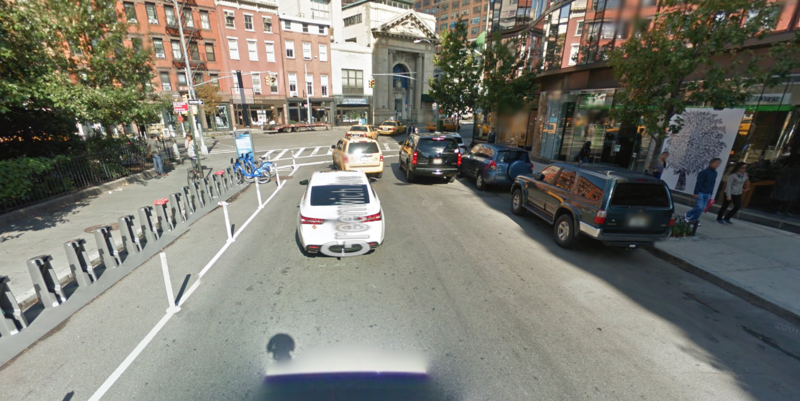 DOT may create a safer cycling connection between Sixth Avenue and Eighth Avenue with a two-way parking protected bike lane on most of Greenwich Avenue — if Manhattan Community Board 2 votes for it. Greenwich is a short street but an important east-west connection in an area where the Manhattan grid breaks down. Even though there is no bike infrastructure on Greenwich, cyclists already account for 35 percent of all southbound vehicular traffic during the morning peak, according to DOT, and the agency’s 12-hour weekday counts tallied an average of more than 850 cyclists. DOT is floating a design for a two-way protected bike lane between 13th Street and Christopher Street along the north curb, leaving short blocks at either end unprotected. That was one of two options for Greenwich Avenue the agency showed to the CB 2 transportation committee meeting last week [PDF]. To make room for the bike lane, Greenwich north of 10th Street would be converted from two-way motor vehicle flow to one-way. South of 10th Street, the motor vehicle flow would remain two-way, which avoids disrupting the M8 bus route. The short block between Christopher and Sixth Avenue would have a two-way bike lane but no parking protection. At the northern end, the short block connecting to the Eighth Avenue bike lane would have no bike infrastructure, and two blocks of Horatio Street feeding into Greenwich would get sharrows. With four feet in each direction for cycling, the bike lane would be on the narrow side, but there’s a couple of feet of street width the DOT could shift over to the bike lane if it chooses. DOT also presented a design with no physical protection that calls for a northbound curbside bike lane and a southbound painted lane next to a curbside parking lane on most of Greenwich. Motor vehicle traffic flow would not be affected. The Greenwich Avenue project is related to another project that CB 2 approved earlier this month — a painted bike lane on 8th Street between Sixth Avenue and Lafayette Street [PDF]. The Greenwich Avenue bike lane would essentially connect bike lanes on Eighth Street and Ninth Street to Eighth Avenue. DOT is not moving decisively to implement the protected lane on Greenwich. Agency reps said their presentation was only to gauge interest in the project among board members, according to people who attended. The transportation committee did not make a recommendation on the project. Why does the DOT provide options? They should propose the strategy which best ensures public health. End of story. 8′ combined seems too narrow. If you’re going to do it, do it right. The Sixth Avenue lane is already too narrow for its level of usage to actually be functional. Everyone can only go as fast as the slowest rider as there’s no room to pass. I see just as many people taking a “motor” lane because the narrow bike lane is clogged. Hate to see that happen here. There’s no need for a 12′ car lane. And both parking lanes can be 8′. DOT could easily add 2′ to the bike lane at least. But where would people double park? Shouldn’t they be able to get away with 2×10′ lanes then? I can’t believe there are sharrowed alternatives in that presentation, and with the sharrows a foot from the curb! It’s like an acid flashback from the Iris Weinshall years. 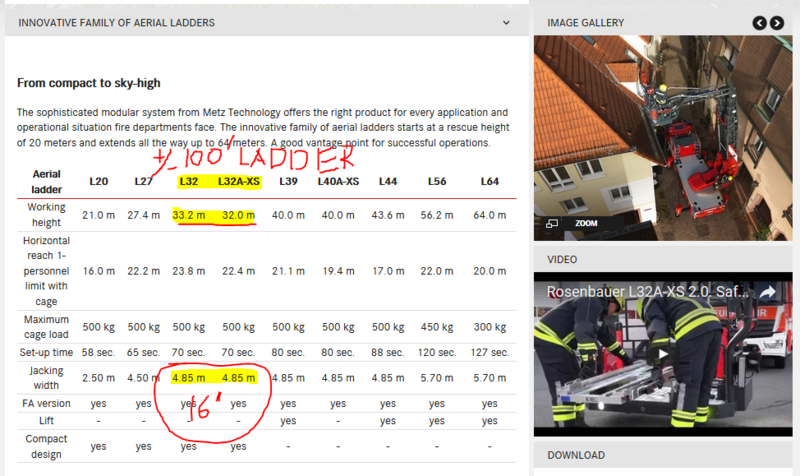 Comparable European fire apparatus (ladder length) might have smaller truck bodies and are more maneuverable… but would have similar outrigger clearances. Travel lanes need not be more than 10 feet wide. They should NEVER be 12 feet wide. Not even on a freeway. If they ever use something like this they’ll need even more space. I’d personally love to take a ride on that thing. I wonder if drone technology will make ladder trucks obsolete in the near future? Correction: the two blocks of Horatio Street would get no bike infrastructure either. Sharrows are not bike infrastructure, and repeating the notion that they are enables DOT to keep using Sharrows instead of bike infrastructure. you really believe any improvement in technology will ever improve the productivity of the inbred, overpaid, lazy, double dipping union thugs in the NYPD ? This is what that last block of Greenwich looks like on Streetview btw. This is where those “Protected Bike Lane” users would end up riding, and they have to go across to the far side of 8th Avenue, and take the lane so they don’t get hooked by all the cars that have to turn right. I just don’t understand the concept behind a protected bike lane network that you need to be comfortable sharing the road on high traffic streets to use. Have they given up on increasing cycling in this city? Why did you decide to pick a thread about the FDNY to start complaining about the NYPD out of the blue?